This is the most frequently performed cosmetic operation in the UK. The breast implant is placed behind existing breast tissue or sometimes under the chest wall muscle. The operation is carried out under general anaesthesia (asleep) and may be done as a day case or with a one night stay. Size is discussed at consultation, the aim being for a completely natural look and not to be huge. Your chest skin and current breast condition will also determine what is possible and safe. Implant types include saline (salt-water) fill, silicone gel fill (the most commonly used variety) and cohesive gel (semi-solid and firmer). The implants may be round or tear-drop shaped (cohesive only). The type that best suits you will be discussed at consultation. The scar, which fades with time, is usually on the under-surface of the breast and this will be discussed, too. The operation is generally not very painful afterwards and pain relief is provided. You will be reviewed by Mr Erel one week and 6 weeks after surgery. Return to work depends on your job. Usually you can drive after 2 weeks and return to work. Energetic exercise with the upper body should be introduced over a longer period after one month and fully after 2 months. Firm support of the breasts with a sports bra is advised for 2 – 3 months. You can wear wired bras after 6 weeks. There is no increase in breast cancer from silicone breast implants. It is usually possible to breast feed after breast augmentation if you become pregnant. 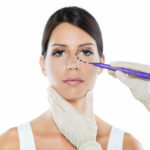 Most women are slightly different and precise symmetry after surgery can never be absolutely guaranteed. There is a small risk of development of ALCL (Acute Large Cell Lymphoma) following breast augmentation with silicone and polyurethane coated implants and 1 in a million risk of breast cancer development with polyurethane coated implants. Modern silicone-gel fill and cohesive gel implants would be expected to last many years and some makes come with a life-time guarantee.